NB10 appeared on BBC Radio Cymru on 18 March 2019, being interviewed by Rhys Mwyn (bassist with Peel favourite Anhrefn) in, as Dr Desperate reported below, “the first ever Welsh language radio interview with Nigel Half Man Half Biscuit”. The interview has been translated and transcribed for us by Pirx The Purist, who is surely in line for a Biscuit Award of some colour. The initial comments which follow were made elsewhere on the site before this transcription was published, but have been moved here so that’s tidy. Rhys Mwyn: I’ve come on a trip to Wirral, and I’m in the company of two men here – Neil and Nigel – and I’m going to start, Neil, how we came to meet was a Welsh class in Mold – part of the Welsh For Adults scheme – but the twist is; learning about archaeology. And that’s how I came to meet you, I believe, Neil? Neil Wyn Jones: That’s right, I remember it well, and enjoying the archaeology classes and going on some trips to see a couple of sites, and learning a lot. RM: …the other people were of an age who thought that I was just involved in the world of archaeology, they’d never heard of Yr Anhrefn. But what was interesting was that you had a background – or an awareness – of bands from Wales. NWJ: Well, as a Welsh learner Radio Cymru was very important to me as someone who was learning Welsh, so I would listen to Radio Cymru all day, and of course become familiar with Yr Anhrefn’s records a lot of other Welsh-language music. So I knew who you were on the musical side. RM: Penbedw! Very good, I’ve been corrected! Very good, Nigel! How had he come to speak Welsh? NB10: Why not? Well, my family was, I think, originally from Rachub near Bethesda, and also Tŷ Croes near Rhosneigr, I think, on my dad’s side. We went on holiday to the Llŷn Peninsula, a lot of Llŷn, Llanbedrog. Today, I walk the mountains in Snowdonia – Siabod, Cnicht – and I thought once, “I must learn a little bit – ‘Hello’, ‘Good morning’” – and I was looking at the local paper – The Wirral Globe – and I saw that there was a night class on Wirral so, why not? RM: I like the answer. The answer “Why not?” is a good answer, isn’t it? But, forgive me now because I’m not saying this in a funny way, but I happen to live in Caernarfon, everyone speaks Welsh, and I can’t imagine that – brilliantly, in a way – that there’s a Welsh class on Wirral. I would have thought that you would have had to travel to Mold or somewhere to find one. Wasn’t it brilliant that there was an opportunity to learn Welsh locally? NB10: Of course, me too. NB10: Just by chance, I’m sure. NWJ: I’d just started working as a tutor. There was another tutor, David Jones from Hawarden, who had asked me – who was teaching on Wirral already – “Do you fancy teaching a Welsh class?” I said, “Well, I’m not sure”. I’d taught people woodworking, but I wasn’t sure, so Nigel was one of the guinea pigs, because I wasn’t I didn’t know what I was doing, but there was a crew of – twelve people? – quite a sizeable group, and Nigel was the first person to turn up and sign on, and then I remember afterwards in that class, at the tea break, Nigel was one of the first people to say, “Well OK, I’ll try speaking a little Welsh at the tea break”, and a lot of people at the tea break would turn back to…well, they wouldn’t have had much Welsh, but it’s important just to use what you can say in Welsh. That’s the way you learn. RM: I just have this picture in my head of you reading the paper on Wirral, “Welsh Class”. Just by chance. NB10: Me too. I don’t know why, in the Wirral paper. RM: Obviously, if you say that you had been on holiday to Wales, and the family connection with Rachub and Tŷ Croes, there must have been something there that made you think, because the rest of your mates were hardly likely to go, “I’ll come with you to the Welsh class, Nigel”. NB10: One friend! But I think Peter gave it up. RM: You know, to be honest with you, I think it’s interesting, I see it as interesting, and on the other hand I agree with what Nigel says, “Why not?”. Of course why not; what do we want to see? People learning Welsh or not? So welcome to everyone, if people decide to learn Welsh, it’s a good thing. So, what was your journey, Neil? You’ve gone from being a learner to being a tutor, and that has had to be a good thing for you – like me, when I give lessons to learners, I have to improve my vocabulary – that has to be a good thing from the point of view of developing and improving your own standards in a way? NWJ: Well that’s what I say to people like Nigel. Nigel speaks Welsh as well as I did when I started learning…the tenses were…I was just learning at entry level. Now, I’m teaching at a higher level, so I’m still learning myself, through teaching at higher levels, but I still say to people like Nigel, “You’re speaking Welsh just as well as I did when I started”. I was working as a tutor, but learning through teaching, that’s what’s important. RM: We’ve landed now here on Wirral, and we’ve talked for perhaps an hour before recording this conversation with Neil and Nigel – and Dolwyn the producer – and we’ve spent the hour, more or less, talking about all sorts of things, we’ve mentioned Y Fflaps, we’ve mentioned The Crapsons, we’ve talked about The Pot in Rhyl, all bases covered…in Welsh! But usually, Nigel, if you go and visit Neil, I take it that it’s an opportunity for you to practise your Welsh, that you speak Welsh with Neil rather than slip back into Birkenhead Scouse? NB10: Yeah, usually, all the time. NWJ: The original crew from the first Welsh class still meets up once a week – about four or five of us? – we still meet in Port Sunlight every Wednesday evening. I teach on Wednesday evenings – another class – and a bunch of us meet and we speak only Welsh. NWJ: An hour, an hour and a half? RM: Next time, go into The Ring – the pub in Llanfrothen – because The Ring in Llanfrothen is a good example of where everyone speaks Welsh. It’s the sort of pub where journalists from England go in and say, “They all turned to Welsh!”. Listening to the two of you now, if you walked into that pub you wouldn’t need to speak English, no-one would realise! NWJ: The greatest compliment I’ve ever had was from someone from around Caernarfon speaking Welsh was, “Oh, I thought you came from Mold, in Flintshire!”. Because I obviously have a Scousey-Welsh accent, so it’s a compliment when people think I come from Flintshire! RM:The accent, when you come to north-east Wales – I know you have to differentiate, the Wrexham accent is different – I could say that if I were in a quiz where, as Neil said, he sounds like Mold, a lot of friends sound similar, only that when you’re speaking English you hear the Scouse element more – I know you’re not Scousers round here – you would be none the wiser, so you could easily sound as if you were from Mold. RM: I have another question now which is pretty important. I’ll start with Nigel. I know that Nigel and I certainly share this; the importance of John Peel as DJ. I grew up listening to Peel every night. But did you hear – who shall we say – Fflaps, Anrhefn – you would have heard a lot of these bands from John Peel? NB10:Oh, and…er…Datblygu. Datblygu, of course. Superb. RM: And a stupid question, Nigel, because we’ve already touched on this. Was the fact that you’d heard Datblygu, or Fflaps, or something, was this part of the process of thinking, “Why not learn Welsh?”? Was the fact that there were bands singing in Welsh any sort of reason for learning Welsh? NB10: Maybe, I’m not sure. But I was more interested in hearing groups from, for example, Caernarfon or Denbigh. RM: There are some people, I’ve heard people in Newport when I did gigs at TJ’s, going, “Well, I sent my kids to Welsh school because I heard Datblygu on John Peel”. RM: You get a lot of that. But perhaps you would have learned Welsh regardless of the bands? NB10: I agree, because when I first heard Gorky’s, they had a lot of influence on me learning Welsh, I’m sure. But the problem was with the south, the slightly different language. RM: So as a tutor, Neil, this is quite amusing, about three years ago if I remember correctly, I went to Nant Gwrtheyrn, and who should be on a course in Nant Gwtheyrn but Steve Abbot (UK Decay), do you remember UK Decay? NB10: Ah, UK Decay, yes I remember them. RM: But Steve is Cerys’ husband. And he was in Nant Gwrtheyrn on a Welsh course, and he phoned me to say, “Come on down for a drink!”, because he just needed contact with the real world, with only learners all around, and he wanted just to talk about punk rock or something. And he had two files in front of him, and I remember looking at Steve, and going, “Steve, you’ve got two files here. What’s going on?” And he said, “That’s North Wales Welsh and that’s South…I’m married to Cerys, I have to do the South Walian version!” Of course, in Nant Gwtheyrn, they’d be talking as you talk. It was hilarious, because I couldn’t understand, “Why have you got two files?” Like they say ‘mâs’ instead of ‘allan’ (*). So, when you’re tutoring, you would just do ‘Mold Welsh’? NWJ: Northern Welsh. There are northern and southern courses. But that’s the important thing to me about listening to Welsh-language music, you hear accents and dialects from everywhere, and then you think, “Oh, what are these words?”. And then you go to it: “What’s ‘mâs’? Oh, it’s ‘allan’, OK. What’s ‘lan’ (†)? Oh, ‘I fyny’. So you learn everything, and sometimes you work with people from the north who don’t speak much with people from the south, perhaps, they just live in a circle in the north, and as learners we sometimes try to listen to the radio, or listen to music, and sometimes we learn a bit of the language, and it’s important. I don’t see much difference. (*) The southern and northern words meaning ‘out’. (†) The southern and northern words meaning ‘up’. RM:The big surprise to me was the Eisteddfod in Bodedern, and Neil walks in – we were helping the the History Tent, talking to people – and Neil walked in. I was very pleased to see Neil, and there’s Nigel with Neil. And of course I know Nigel’s history with Half Man Half Biscuit, but what was great, Nigel, was that we spoke only in Welsh. So the first time I met you, we spoke in Welsh. NB10: Ah well, yeah, yeah. NB10: You said to me, “Hanner Dyn, Hanner Bisgedi”! I remember! RM: But it was right bonkers to me to meet Nigel, who I’d heard on John Peel, and knew the songs, but I have never – and this is bizarre – I’ve never really talked with you in English! RM: Have you ever been tempted in any way to write a song in Welsh? NB10: Some day, I think. I hope. When I was at the Learners’ Eisteddfod, I kept threatening to write a song, on the tune of ‘Calon Lân’, but not with the words. An access course, you know. NWJ: I remember Nigel writing something for the Learners’ Eisteddfod when he was in the class. I have a copy somewhere. He had written it and I as the tutor had put the work forward for the Learners’ Eisteddfod. You didn’t win, and I’m not sure what the story was, but I was very proud that someone in the class had chosen to write something. It was a Welsh version of one of your songs, if I remember correctly. NB10: So in Cardiff this week, I hope to try ‘Mochyn Du’, for example, because I’m very fond of the film ‘How Green Was My Valley’. I know John Ford didn’t speak Welsh, but the songs in the film; or a punk version of ‘Sosban Fach’, perhaps. NWJ: No, very good Nigel. There’s an interesting story to this, you see, they’re not what they appear to be, there’s more to them. They can be ‘punkified’, if you like. The ‘roots’ are good. NB10: Perhaps. Well, hopefully…But I’m sure, it’s one thing to speak eastern Welsh and another to speak southern Welsh. NB10: Ah, I remember, yes! RM: …which is superb. You sometimes wonder why more bands haven’t something in Welsh. I was listening to Joe Strummer singing a song in Spanish. I think it’s brilliant; the more things which are created, great, just bring it on! RM: So what we are doing tonight, Nigel and Neil, is that every song on the show are requests which have been chosen, but they must have the name of a place somewhere. So we’re playing New York Dolls, we’re also playing ‘Barafundle’ by Gorky’s; but you as Half Man Half Biscuit have made a lot of references to places. NB10: Well, I never thought about it until someone said, “Yeah, you’ve done a lot of songs…”, and I thought, “Well, yes I have!” I’m not sure why. Perhaps it’s because I can hide from the problems of rhyming…so, I’m not sure why. RM: Apart from the place names, I have to say that just the concept of the song ‘National Shite Day’. The genius of writing a song called ‘National Shite Day’, because we all have shite days, you know! RM: That was a song that had to be written, wasn’t it? NWJ: Talking about place names in Nigel’s songs, one I have great respect for is squeezing ‘Cofiwch Dryweryn’ into a song, which was…the way he’s fitted it into the song. I remember in the class, we had a chap who, unfortunately has died since then, Peter. He was working for Dee Valley Water, a small water company which is part of another company now. But Peter – there was a lot of leg-pulling – and Nigel had gone to Birkenhead Market and had had printed a t-shirt with ‘Cofiwch Dryweryn’ on it. And of course, Nigel was wearing this in the class. But the joke was that Nigel had said he had gone to this girl in the market in Birkenhead, and she’d said, “Oh, you’ve forgotten the mutation!”. RM: What do you see at present from this side of the River Dee – you’re literally looking at Wales from here – what do you see – Neil to start – as the current scene? You look at what is going on in Wales now, we’re in a new period – Gorky’s, Cerys, all of those, Gruff Rhys, are the ‘elder statesmen’ – how do you see today, or what do you see of the music coming from Wales now? NWJ: Well, from this side, I think that the scene is pretty healthy at the moment. I try to find songs to use in the classes, and I use a song by Lily Beau, ‘Treiddia’r Mur’, and I thought, “Oh, I love the song!” So I found the words and we listen to the song and just go through the words, and I think people have learned through the words. So I think that there are so many young artists coming through, it’s great I think. RM: And Nigel, we were talking earlier about how we were same listening to John Peel every night. Peel is no longer with us. How do you find out nowadays what’s happening, or which bands are coming up? NB10: Well, I have a lot of friends who’ve said, “Oh, listen to this”, or “Listen to that”. Radio Cymru, the internet as well, of course. I follow The Pot in Rhyl, so there’s a group playing in The Pot, OK. I’ll see another group supporting the group in The Pot, so it’s the only way I can keep up with it. NB10: Radio 6 is very good, certainly, and also the internet, well YouTube. RM: That’s the way. It’s interesting, because John Peel was the go-to so it was easy. NWJ: It’s easier to keep up with the Welsh-language scene rather than the English scene because that is so big. RM: The landscape has changed. So, you’re in the Tramshed this week, a gig in Cardiff, they’re very lucky in Cardiff, Nigel. You don’t do a lot of gigs? NB10: No, I can’t get used to it. After thirty years, we get real nerves. Well, no, we look forward to it; the stage is the problem. But I like the Tramshed, I like Cardiff, a splendid city, I think, Cardiff. RM: Neil and Nigel, it’s been a pleasure. Thank you very much for your company tonight. NBdeg on BBC Radio Cymru 7-10pm tonight, being interviewed by Rhys Mwyn (bassist with Peel favourite Anhrefn) in “the first ever Welsh language radio interview with Nigel Half Man Half Biscuit”. The show also features Bangor University tutor Neil Wyn Jones (possibly the Eisteddfod chair-building carpenter from West Kirby), discussing teaching Nigel Welsh. Much as I am fascinated and delighted to hear that Nigel has learnt Welsh – and at my old Uni too – how many of us will understand a word of the interview? Currently playing a session version of NSD. You don’t get this on Tom Robinson. I have to say, Nigel sounds a lot more comfortable being interviewed in (“Scousey”) Welsh than in English. Mentions of UK Decay singer Steve (Mr Cerys) Abbott, The Wedding Present, New York Dolls and Eartha Kitt; clips from Trumpton Riots and Stiperstones. Insofar as I can comment on a langauge* I don’t speak, read or understand, he sounds pretty confident in it. While he slipped in a few English phrases, so did Rhys Mwyn, so I think honours are even. Quite good fun picking out the few bits I could just about catch, there was a reference to 4 or 5 where I caught the pedawar pimp. Not a lot of call for cymraeg in Oxford, sadly. Nigel didn’t start learning Welsh for any specific reason but he had family from Rachub (near Bethesda) and Ty Croes (on Anglesey), had been on holidays to Pen Llyn, and goes walking in Snowdonia a lot, and felt he had better at least learn a little bit of the language. He was an advert for the class in the Wirral Globe and was the first one to register. Nigel says the biggest complement he’s had on his Welsh is that someone from Caernarfon (a very Welsh-speaking town) thought that he was from Flintshire i.e. the person couldn’t tell that he was from outside Wales. Rhys and Nigel discussed the importance of John Peel to both their bands. Nigel had heard bands such as Fflaps, Melys and Datblygu on JP and this was probably also a reason why he was interested in learning the language. They also talked about the differences between north- and south-Walian dialects and how listening to music can expose you to the different words and help you learn. Rhys mentioned his surprise at seeing Nigel as the 2018 Eisteddfod in Bodedern and greater surprise at the fact they were able to speak Welsh the whole time. Nigel speculated whether they’d used the Welsh ‘Hanner Dyn Hanner Bisged’ instead of the English band name. Asked if he would ever write a song in Welsh, Nigel said that he does hope to one day. He wrote a song for his class at a learners’ Eisteddfod one year. He would maybe consider a punk version of Sosban Fach – in the hope that a punk delivery might mask a lack of fluency. Rhys mentioned that every song on tonight’s show had a place name in the title or the band and commented that there are a huge number of place names mentioned. Neil (Nigel’s tutor, who was there throughout and contributed a lot himself, sorry for not mentioning him!) said that he was impressed Nigel had managed to get the phrase ‘Cofiwch Dryweryn’ into a song. They also mentioned that to wind up another person in the class who worked for a water company, Nigel got a t-shirt printed at Birkenhead Market with the phrase on, and joked that the girl at the market told him he’d made a grammatical error! And there was lots else discussed, as I said a lot from Neil too but those are the main bits from Nigel. So there we are, at least one Welsh-speaker on this page! Seconded, Albanwr, diolch! You may consider me delighted. I picked up a few references – to Fflaps, and to Cofiwch Dryweryn, and guessed the first was a band, and have read about the second here, but frankly that was clutching at straws. Oh, and sospan fach, but that one was easy. I can imagine that a Flint accent might be a bit “scousey”, but as Caernarfon really is in the Welsh-speaking heartland I’d be might chuffed with a compliment like that. Somehow I don’t think any of us are surprised that he walks in Snowdonia a lot. Yes, “diolch yn fawr” from all of us Albanwr (so “tapadh leat” is appropriate too? ), great to get access to some of what was said there. 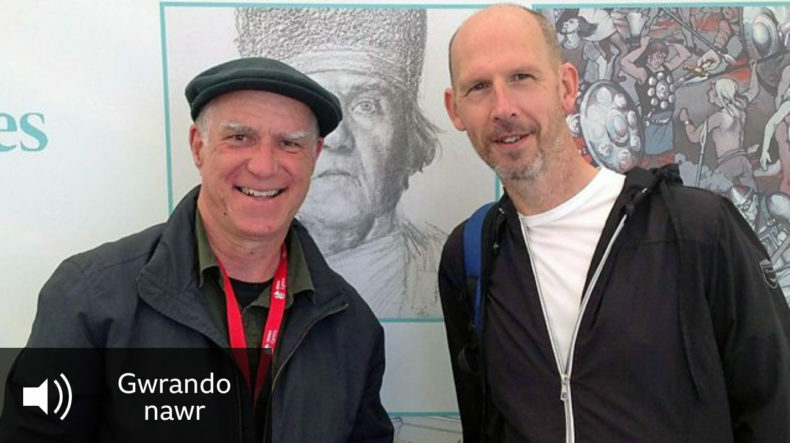 So one deduces that lovely photo of Rhys and Mr. B on the BBC Sounds page is from the Bodedern Eisteddfod (seems to have visuals of Druids and Romans in the background)? Was surprised meself the bardic powers-that-be never took their 2017 bash back to Birkenhead Park, to mark the 100th anniversary of the ‘Black Chair Eisteddfod’. Hope Huw Stephens feels well embarrassed now for ignoring my list on St. David’s Day. Not much further investigation was required to find Rhys Mwyn pictured on the Anglesey Druids twitter feed, wearing the exact same garb, on 6th August 2017 in the History Pavilion at the Eisteddfod in Bodedern. It would have been nice, although the anniversary was certainly not ignored, the Hedd Wyn story being the focus of the main concert of the week. I’m not sure how it worked in 1917, but these days to host an Eisteddfod requires a dedicated local committee able to raise the large sums involved in hosting such an event and I can’t imagine there are enough Welsh speakers on the Wirral any more to make it possible. I though that NB acquitted himself very well here, apart from occasionally putting the adjective before the noun (which mostly doesn’t happen). Da iawn, ‘gwas i! Absolutely flaggerbastard, @Pirx! Bisged platinwm at least. Seconded, that’s fantastic work. Platinum Biscuit with leek cluster. That’s great work, Pirx. Diolch yn fawr. Inspirational stuff, especially when you hear that Neil Wyn Jones himself learned from scratch. They get Welsh telly on the Wirral too of course, so that can help a bit! Wonderful to hear that our bard entered the Learner’s Eisteddfod, and to learn as well that his tutor has even built bardic chairs – in the past I’ve actually addressed Mr. B with a phrase from the Crowning of the Bard ceremony which seemed appropriate at the time – but I had no idea how appropriate! Thanks all for your kind words. Please also note that at no time did I try to spell an interviewee’s laugh.